Disenchanted with Think Twice's offerings in the last couple of months, I hadn't made any purchases in any of their three Antwerp shops. Plus, I'd missed their previous sales days, which usually yield a few treasures, as they took place end of last year, just when I was enjoying my Christmas break. In spite of having paid regular visits to the shops since returning to work in January, nothing really took my fancy, their stock being predominantly 1980s and later. Scanning the rails, my eyes usually pick out any items worth exploring from a distance. Once in while, my heart started beating faster when I clocked a fabulous 1960s or 1970s print, only to be disappointed when said item turned out not to be even remotely my size. So, when their sales email dropped into my inbox a couple of weeks ago, I patiently waited until prices were down to € 5, giving the shops a wide berth on the -30% and -50% days. 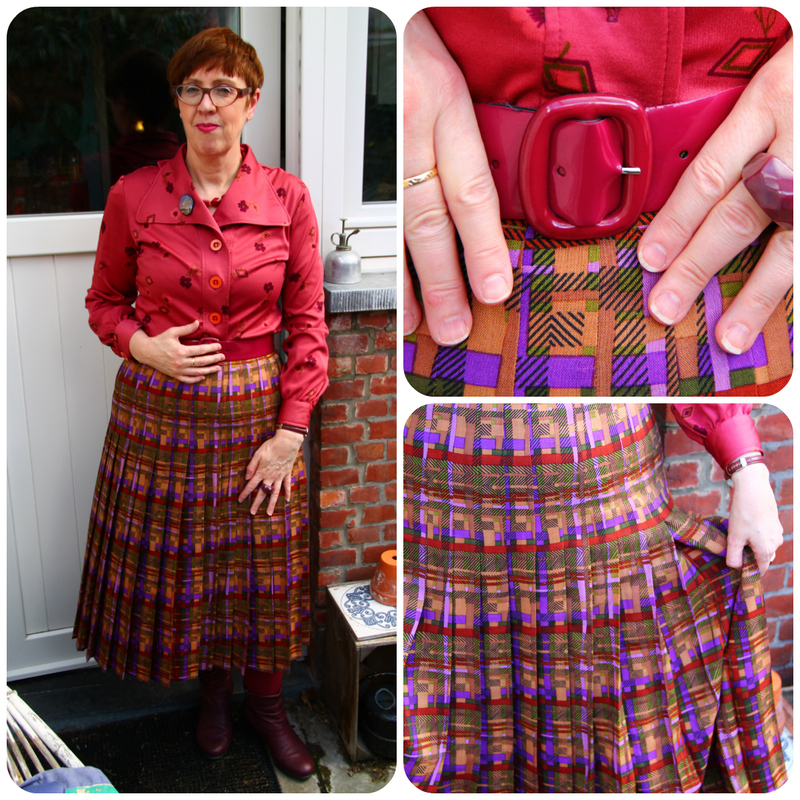 I'm happy to say that my patience has paid off, as I was able to buy both the delightful checked jacket and the colourful pleated skirt I'm wearing here for € 5 each! That's what I call a bargain! The skirt is lined, and as it doesn't have a label, I presume it was handmade. With so many colours represented in the print, there's a wide range of tops for me to choose from. 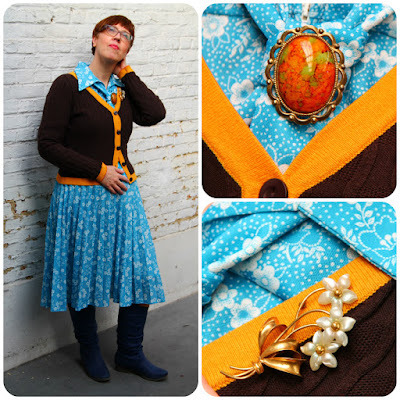 I hadn't worn this vintage blouse for a while, so it was high time it got an outing. 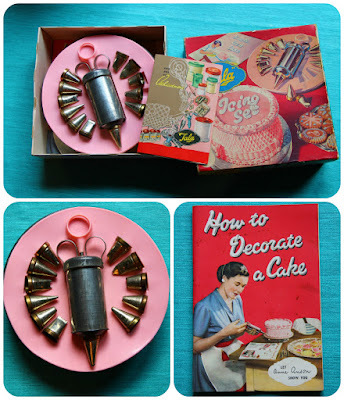 I bought it at the sadly missed Blender Vintage Shop several years ago. 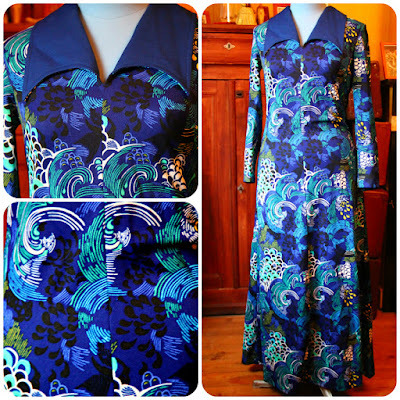 I love its colour and print, as well as the rather unusual wide wing collar. The burgundy beaded necklace, which you can just catch a glimpse of, came from the same shop. Here's a closer look at the jacket. 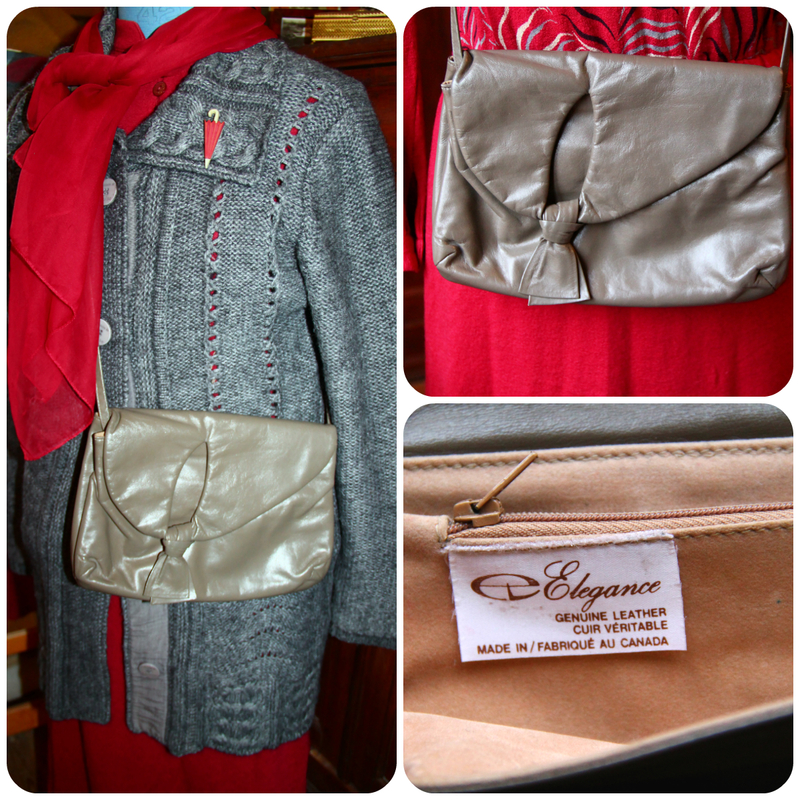 It's belted quite low on the hips and the belt loops are hidden under the pocket flaps. 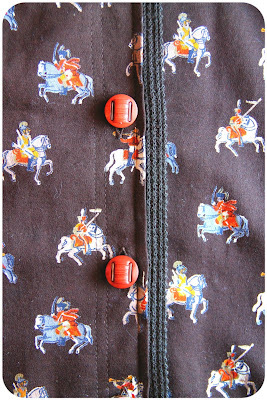 You'd expect these to be just flaps, but no: much to my delight they are actual pockets! The great thing about Think Twice is that while the sales are in full swing, new items keep being added, right until the € 3 mark. Someone explained to me once that the bags of clothing they receive at this point are considered second rate, but that's fine by me, as it's then that the most exciting pieces turn up. Who wants old tat from the 1960s and 1970s, eh? Well, me, obviously! 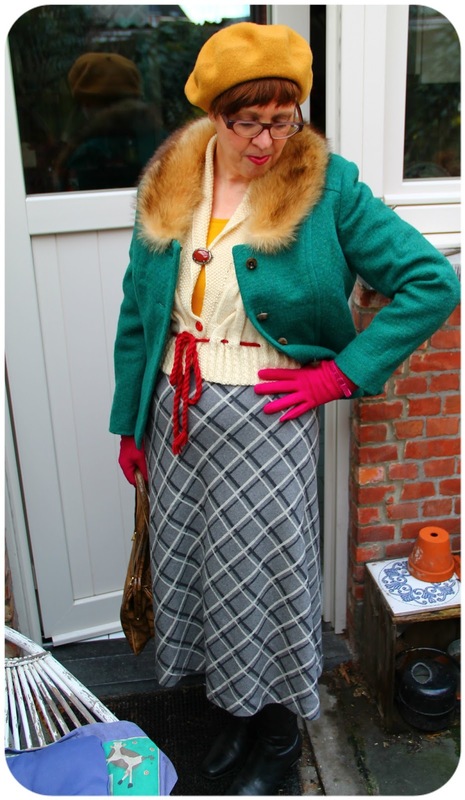 Here's the lovely Angelica modelling all the other things I grabbed for the bargainous price of € 4 and € 5. 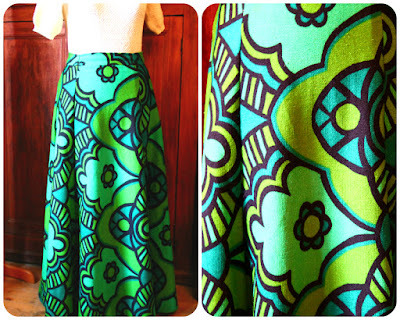 I guess I don't have to tell you that the full maxi skirt with its fabulous print is Skandinavian. It is lined and quite heavy. Quite an eye-catcher, don't you agree? 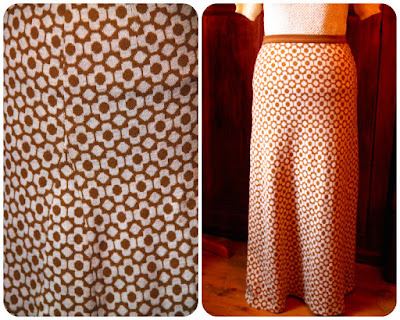 Another maxi skirt, straight this time, and knitted in a cream and brown pattern. The photos really don't do it justice. I'll have to do some outfit photos wearing it, so that you can have a better look. This heavy wool skirt was Made in Germany and made me think of Beate. This was even harder to photograph, especially as it was quite a dark day. 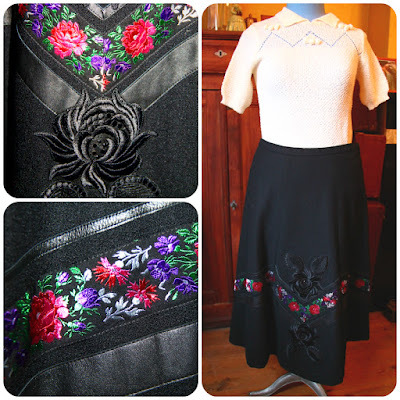 Strips of leather and folksy embroidered flowers are sewn in a chevron pattern near the hem and there are two elaborate fabric flowers with black sequinned hearts on the front. I think it would go rather well with my red traditional German cardigan! More flowers in this vibrantly coloured summery skirt. I can see quite a few possible companions among my Summer tops! 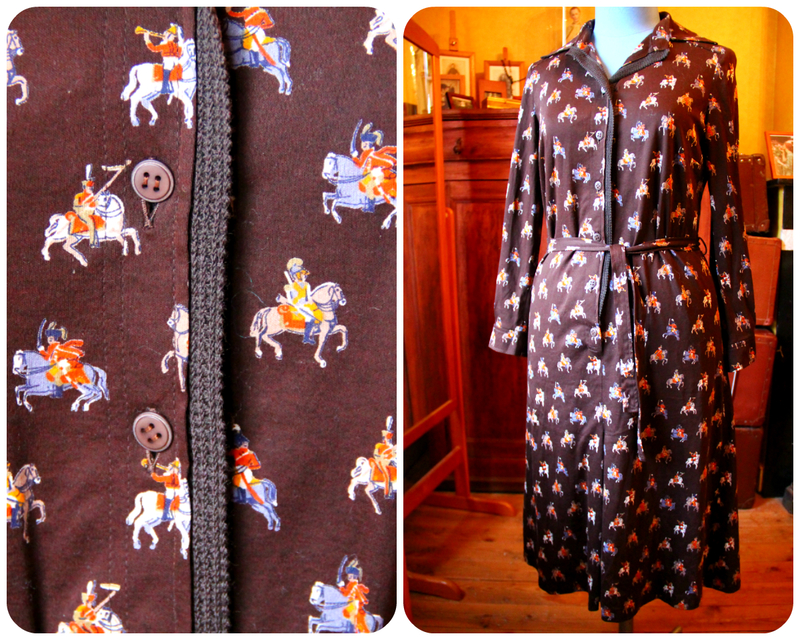 Quite an unusual print for this 100% cotton lined dress, again made in Germany! 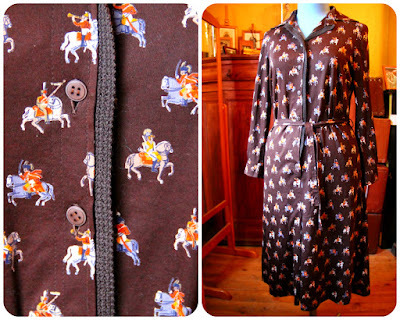 I loved its chocolate brown-ness, the vibrant colours of the horsemen and the braided ribbon edge. 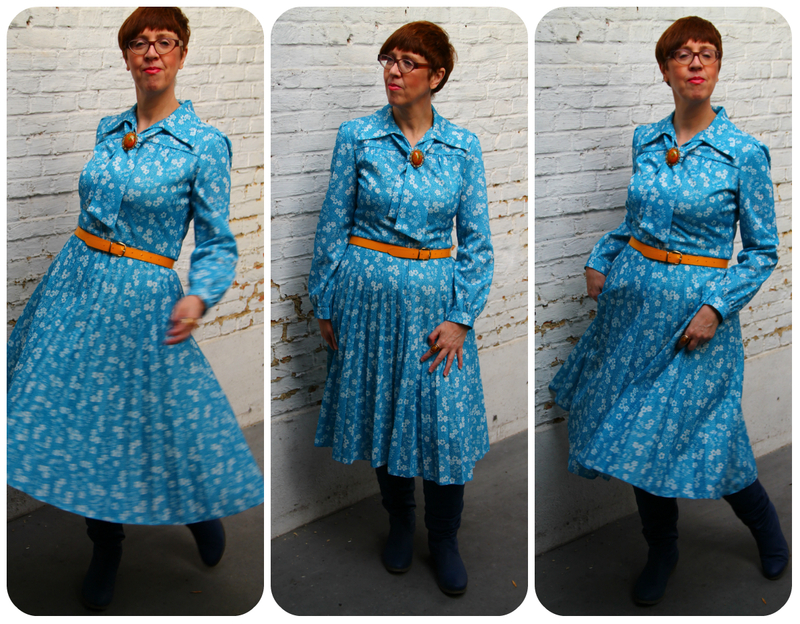 € 4 surely was quite a steal for this gorgeous long-sleeved maxi, with its funky blue and white print, with the odd bit of yellow thrown in, and its solid blue wing collar. 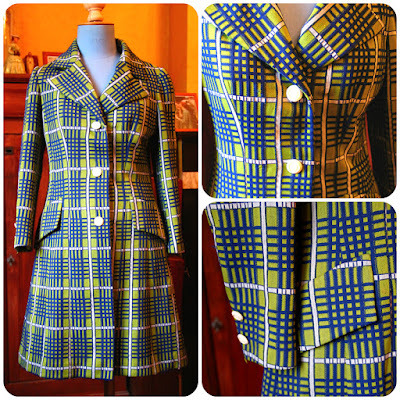 On my way to the till, my arms full of stuff, I passed a rail of coats, when out of the corner of my eye, I spotted a flash of chartreuse and blue plaid. Bingo! 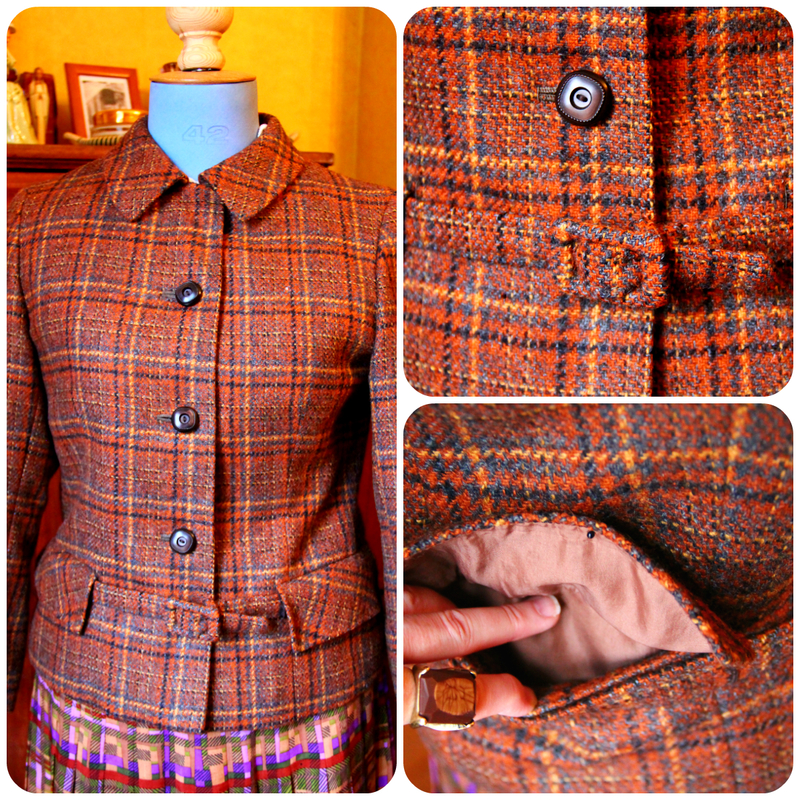 This gem of a coat just screamed Swinging Sixties, Carnaby Street and yes, Twiggy! I didn't feel like queuing at the fitting rooms again (there are only two, and the queue as you can probably imagine very long) so I took a chance on it. Luckily, it fits, if only just. But hey, it's a Summer coat, and I'll probably wear it unbuttoned a lot of the time. 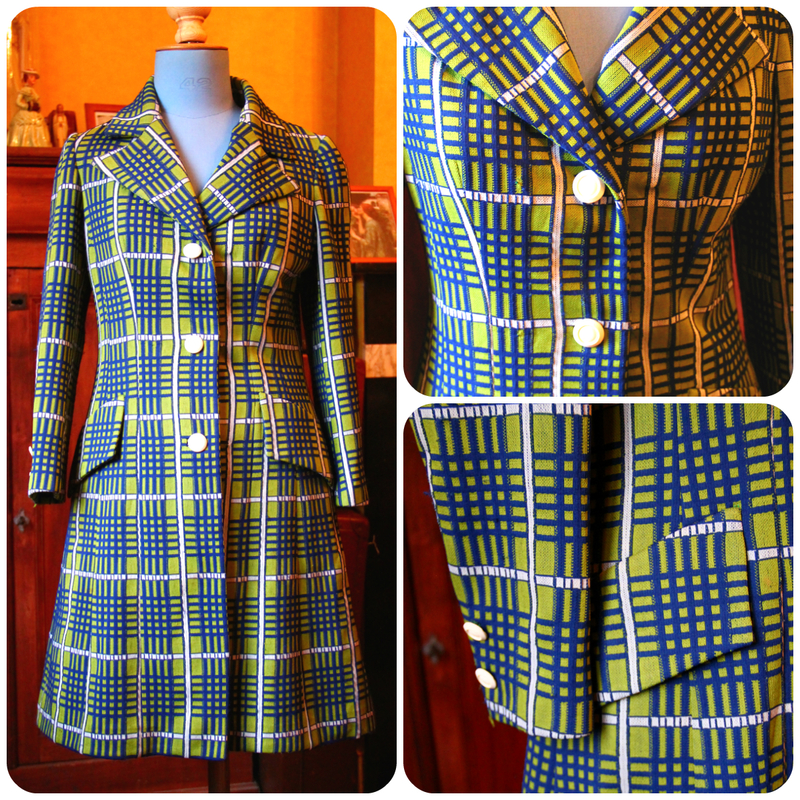 If I hadn't already been won over by its 1960s mod print and model, the label would have done so! 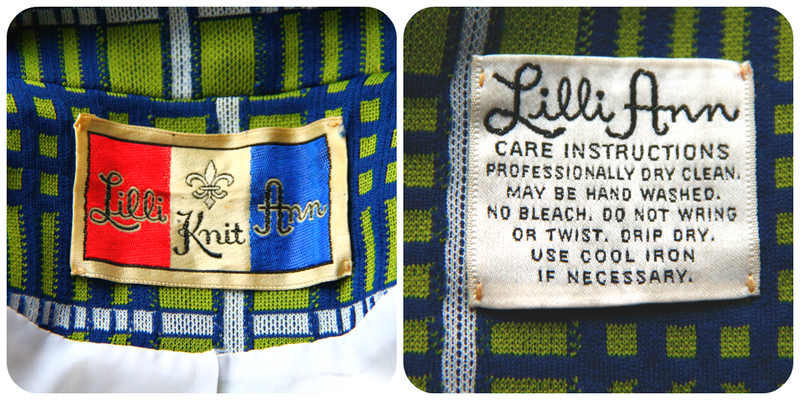 "Lilli Ann was started in San Francisco in 1933 by Adolph Schuman, naming his company for his wife, Lillian. The company became known for their beautiful, elaborately designed suits and coats. After WWII, Schuman went to France and it was during this time that the labels had “Paris” added to them. In the 1960s, there was a popular Lilli Ann Knits line, and a mod-inspired London line." Not bad for € 4, I'd say! My last find was this grey shoulder bag, made from the softest of leathers, and decorated with what looks like a small tie. And look: not made in China, but in Canada! What do you think of that, Sheila and Suzanne? Doesn't Angelica look elegant in her burgundy and grey outfit? I like to play dress up with her, and this is what she is currently wearing! Do you have a dressmaker's dummy, and do you dress her up as well? 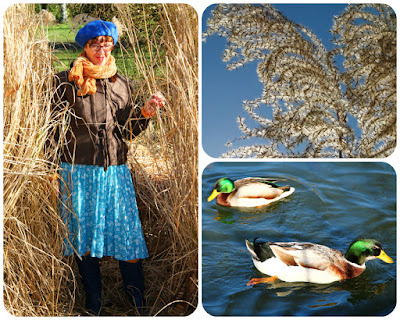 Linking to Patti's Visible Monday at Not Dead Yet Style as usual. With yet another month or so to wait for Spring to officially arrive, Winter finally decided to regale us with a cold snap. Or at least, what passes for a cold snap in Belgium, where snowstorms are often imaginary and people start stockpiling essentials at the mere mention of the word snow. Nevertheless, if by cold snap subzero temperatures but crisp sunny days are meant, then I'm game. Now where do I sign up? I'm casting my mind back to two weekends ago, when Saturday turned out to be bright and sunny. I wasn't feeling too bright myself, and not really in the mood for our usual charity shopping trip, but when one of us suggested a walk in the park, we quickly grabbed our coats and went off. This dress is a firm favourite which surprisingly hasn't featured here yet. The sky blue fabric with its tiny white dots and sprinkling of white flowers, was the perfect antidote to the cold I was about to develop. 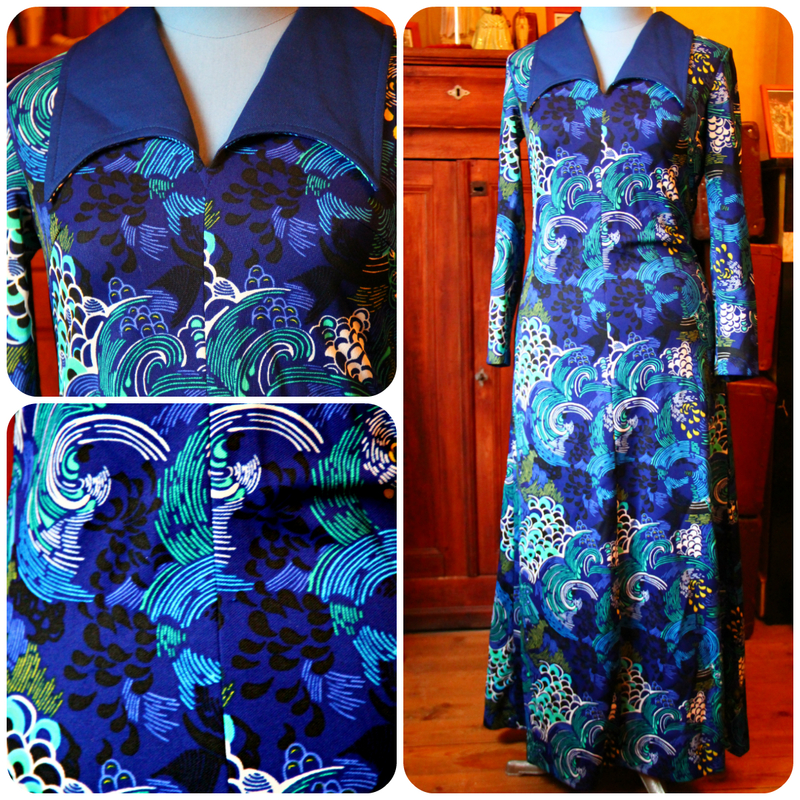 Who needs medicine when there are frocks like this one? 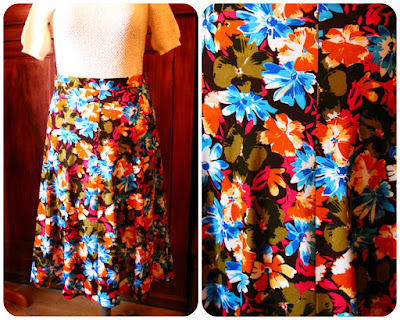 It's got a pleated skirt which is perfect for twirling. Well, that's what you do when you're wearing pleats, isn't that right, Natalia? The dress also has a tie, which I knotted and secured with one of my larger brooches, featuring an orange stone swirled with green. 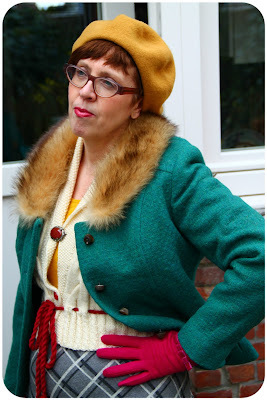 There were belt loops but no belt, so I added an ochre yellow vinyl one, as well as tights in the same colour. 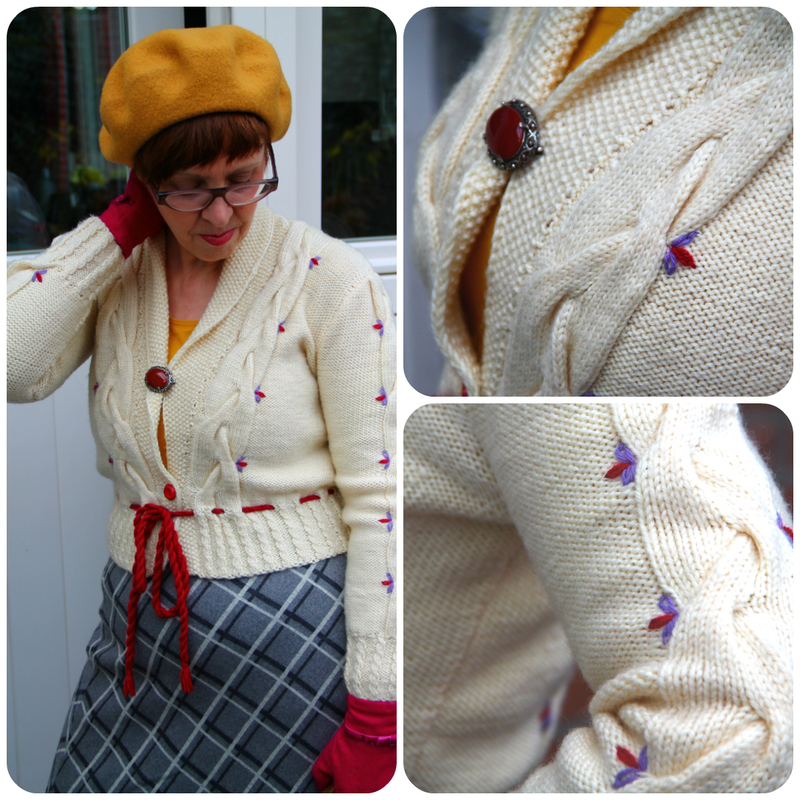 On top went a brown cardie trimmed in ochre yellow, to which I pinned a posy of mother-of-pearl flowers. 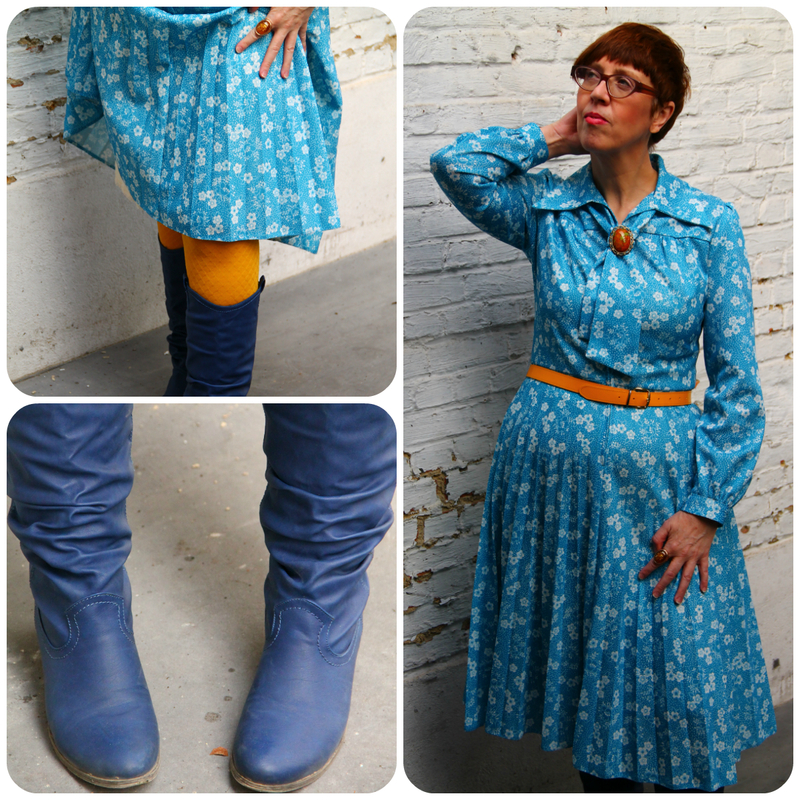 And look: I'm wearing the blue boots, which I'm happy to say cleaned up rather well. 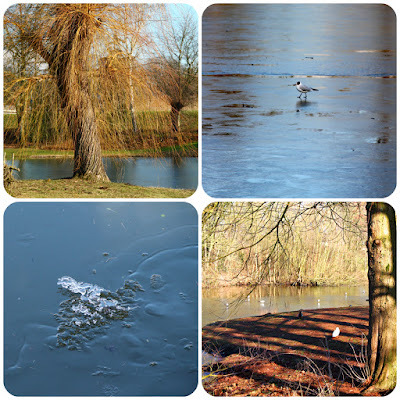 The park was wearing my colours too, the partially frozen pond a deep blue, with the reed beds bordering it a pale yellow in contrast. 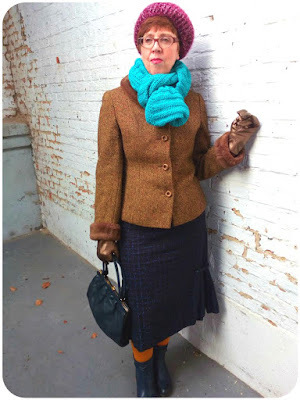 Here's my brown fur-collared jacket again, with the blue beret and crushed velvet yellow scarf continuing the colour theme. 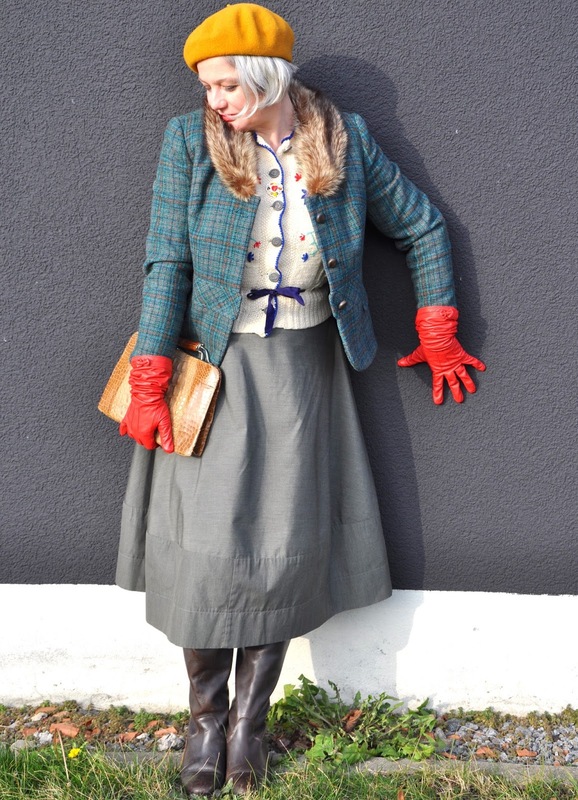 I'd forgotten my gloves and my fingers were turning blue by the time we got back to our car! 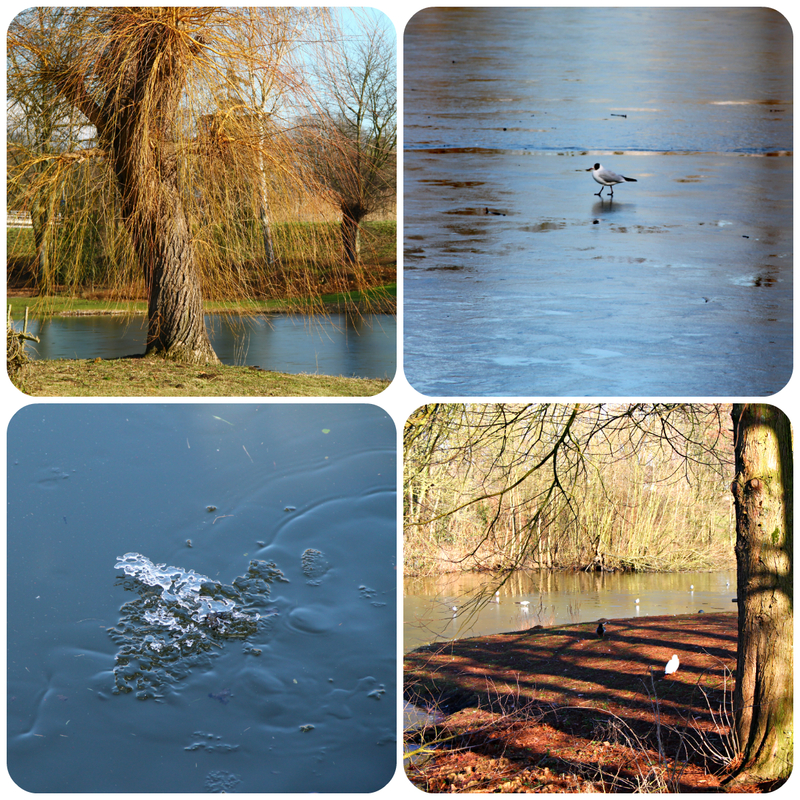 Lots of birds, in gaggles or twosomes, as well as the odd solitary one, were gathered here for a bit of ice-skating. A trio of geese was practicing a choreography routine, while a duck was doing the duck-step on the brittle ice. 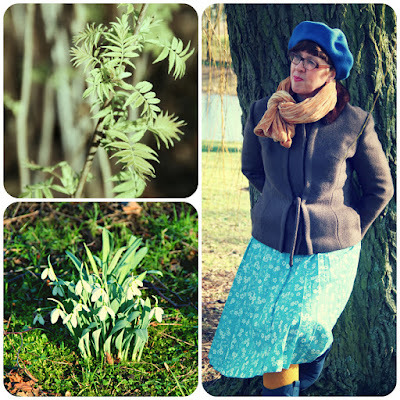 There were clumps of snowdrops and some plants were daringly displaying fresh green shoots. 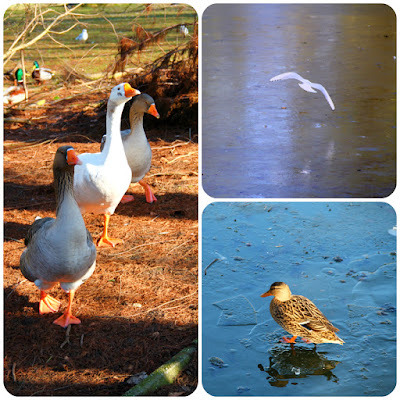 A white goose was on a wild goose chase after an ice-skating moorhen. 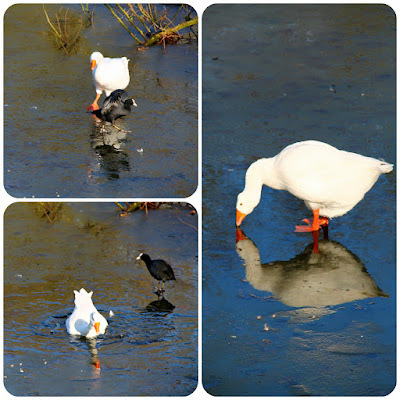 Alas, the thin layer of ice wasn't strong enough for her, leaving her in a precarious position in a gap in the ice. I wonder, does she realize it's her reflection she sees? The tall grasses bordering the stream in the water garden made a perfect hiding place. But the big bad wolf huffed and puffed and blew my cover. Oh well, I'd better come out then! The next day, Sunday, I was feeling a whole lot better. It's as if my cold had decided to give up and go in search of a more willing victim. That was fine by me, as we had another flea market to go to. Our favourite one, in Mechelen. My next post will reveal what I was wearing, but here is what we found. 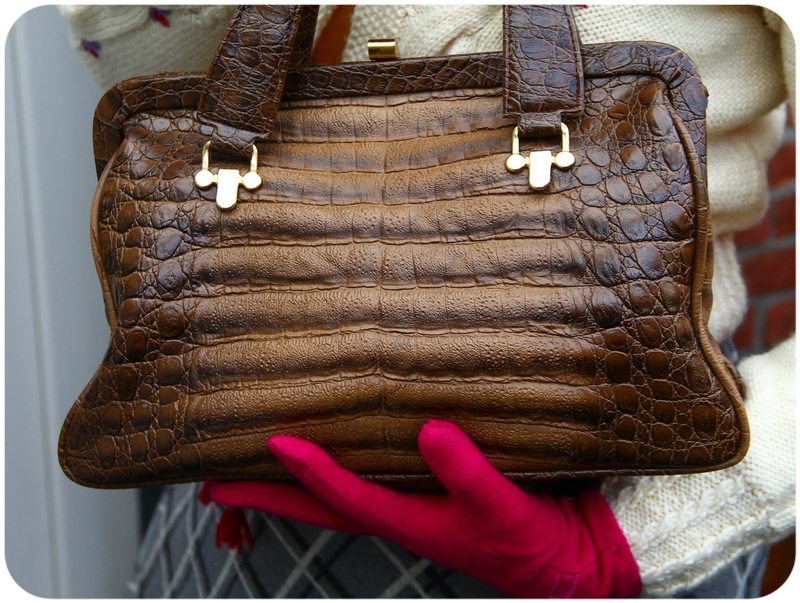 There were handbags galore. The top one is a large and rather heavy carpet bag. It's so big that I was able to put the handbag I was carrying inside, with space to spare. It was € 5 and so was the tan bag on the bottom left, which both came from the same stall. 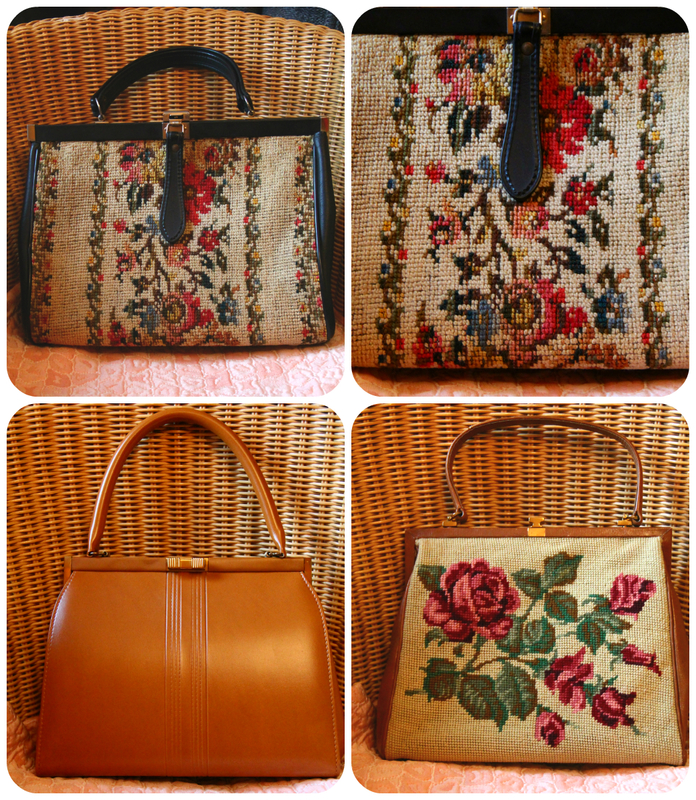 The gorgeous tapestry bag with the roses was bought for € 10 from another stall. No gluttony of brooches this time. In fact, I only bought two: a delicately painted portrait of a lady on a pale blue background, and another Scottie! Both came from the same stall, owned by a very nice French-speaking lady. 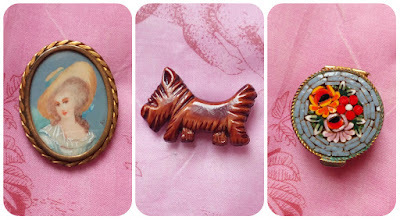 She's selling the most fabulous brooches and although she isn't exactly cheap, as I'm a regular, she's always willing to give me a discount. On the right is a small pillbox, its lid inlaid with micromosaic, which I found towards the end of the market. To my surprise, the seller was only asking € 3 for it. 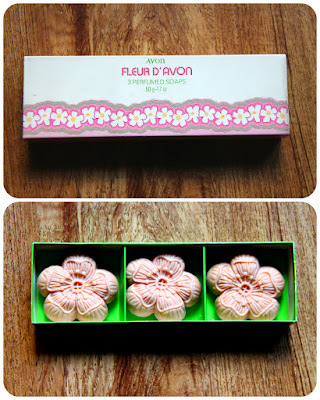 This box of flower shaped soaps transported me back to my childhood, when the Avon lady came calling at our house. I'm sure my Mum must have bought these soaps at some point, as they look so utterly familiar. 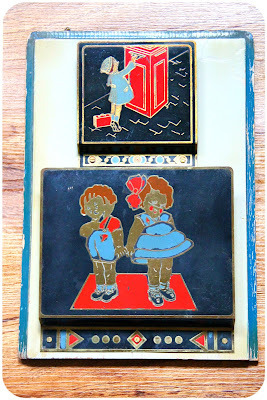 Our last purchase was this vintage wall mounted newspaper and letter rack. We have a few of these dotted around the house and they are perfect for keeping paper clutter at bay. Racks like these are quite easy to find here, usually in dark wood, with embossed brass holders, or decorated with brass or carved wood shapes. Dogs seem to be a recurring favourite. This one is rather unusual, with its painted wood base and metal holders with naive children's illustrations, somewhat reminiscent of Mabel Lucie Attwell. The seller confirmed what we already suspected: it's 1930s. It has already found its rightful place at Dove Cottage which, after all, is basically a 1930s two-up two-down. It's hard to believe that we are already more than half way through February. Time really does fly! 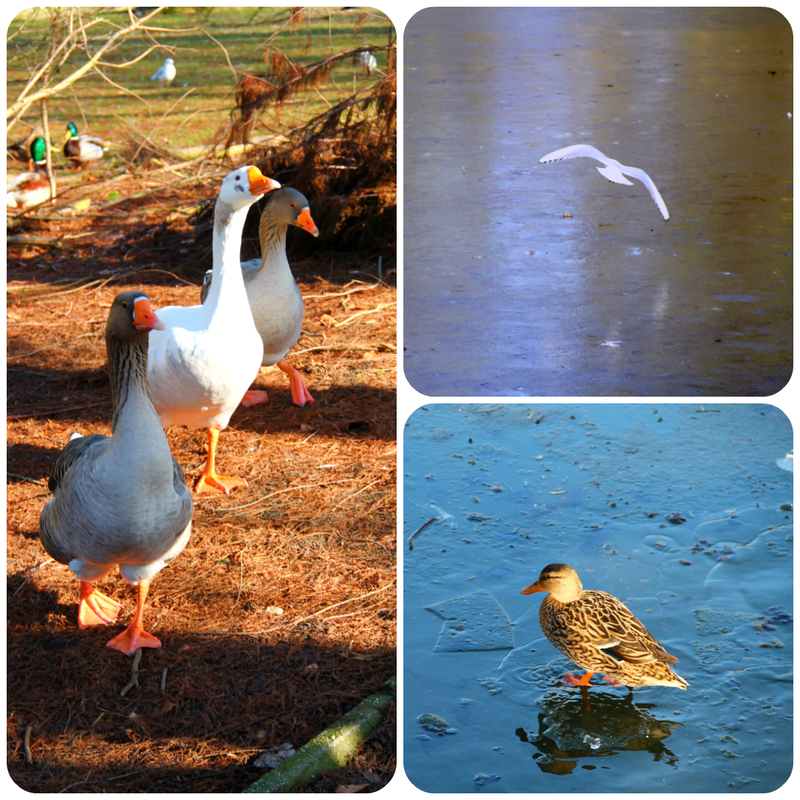 Signs of Spring, however small, can already be spied, and the days are slowly but surely getting longer. In fact, last Monday morning was the first time in months I left the house in daylight, and for a week or two now darkness hasn't yet descended while I'm making my way home. Even so, I have to set the Time Machine back a couple of weeks, to February's first weekend, as I hadn't finished telling you about it. Before we left, we briefly stepped outside for outfit photos. It was chilly, even though I was wearing a - gasp! - jumper! It's a cardigan actually, but I'm always wearing it as a jumper. It isn't vintage either, nor is it new-to-me. It's King Louie and picked up from an outlet shop while on holiday in Belgium's west country back in 2013. 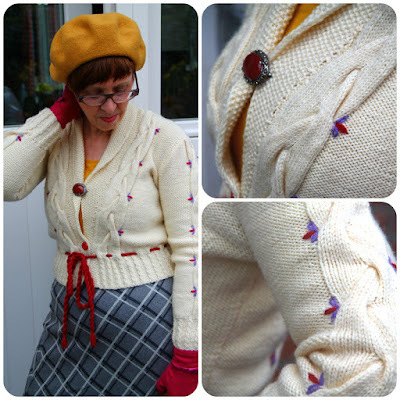 I love its deep ochre yellow and, of course, the blue rosebuds and diamond pattern at the yoke! I came across this skirt in one of the charity shops we'd visited the day before. The fabric's a sturdy cotton, in very dark blue, almost black really, with a lighter blue plaid pattern, and tiny speckles in off-white and burgundy. I never thought I'd see the day I'd be wearing a pencil skirt again, but the two rows of kick pleats left and right, gathered by buttoned tabs, make it quite comfortable to wear. 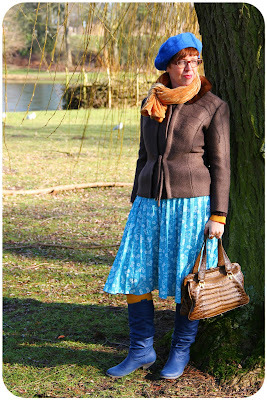 My opaques were the same colour as the cardigan, and I chose a pair of blue booties. The skirt which came with this Tweed jacket hasn't been worn for a long time. 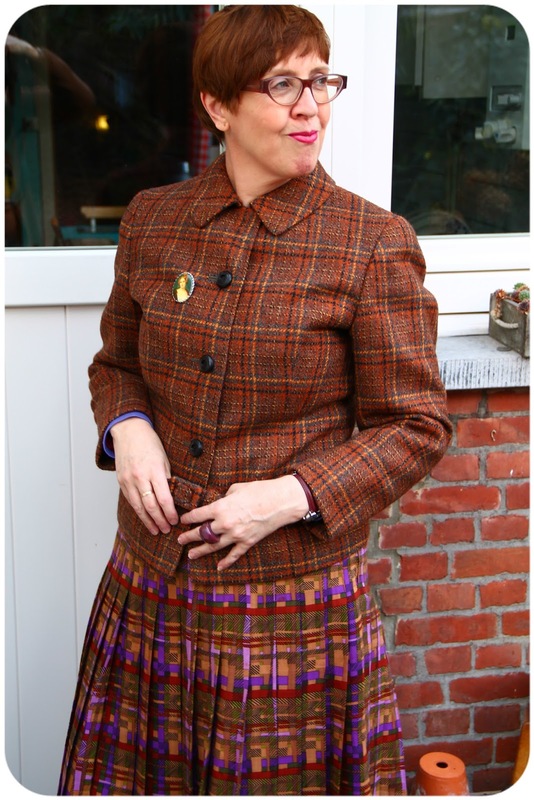 Although I like how the suit looks when worn together, the Tweed fabric, even though it is lined, is rather scratchy, even when I'm wearing a thick pair of tights. The jacket often sees the light of day, though. 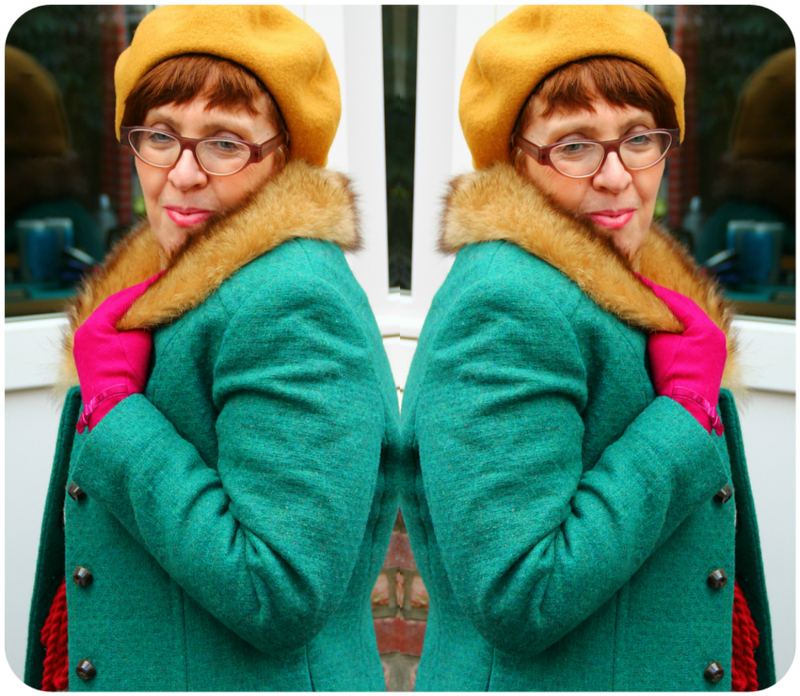 Here I added my warm woolly burgundy hat, one of my new scarves bought the day before and my gold leather gloves, which have already seen a lot of wear since I bought them in the January sales. At first sight, the flea market didn't seem to be very promising with many gaps between stalls, but we soon came across a stall selling new leather boots for € 10 a pair. 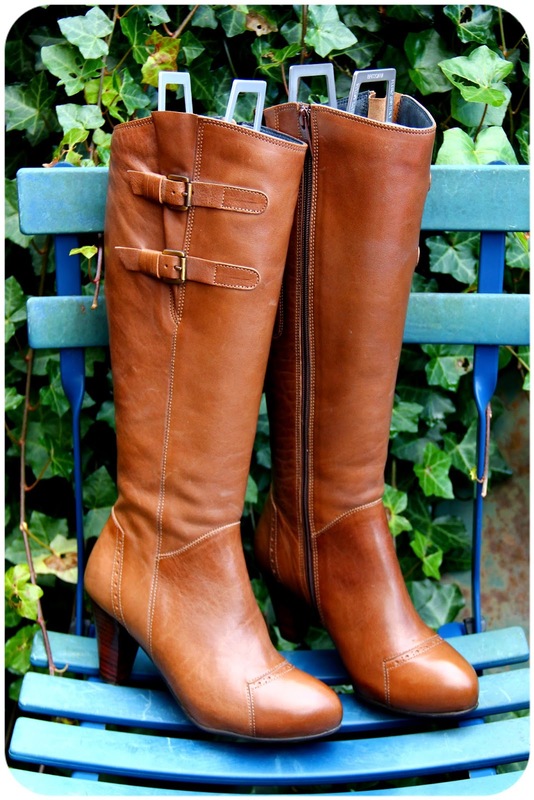 They even came in different calf widths, so when I tried on this gorgeous tan pair, I was glad to find I could zip them all the way up. 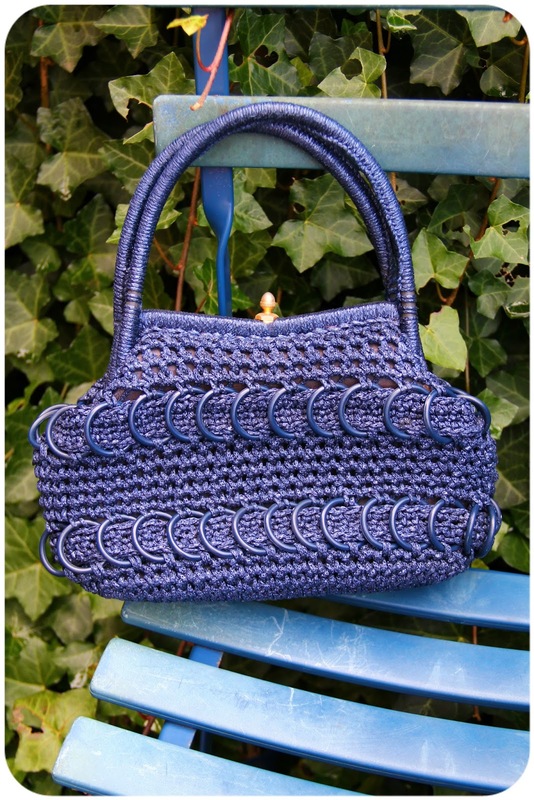 This blue woven handbag with two rows of plastic rings was hiding at the bottom of a box. It was mine for € 5. 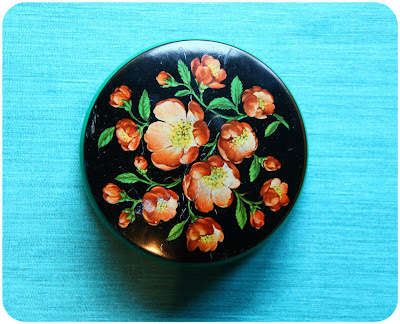 I couldn't resist this pretty little tin. Aren't those colours gorgeous? The bottom half is a solid green and marked "Victoria", a Belgian chocolate brand which stopped trading in the 1970s. We stopped to talk to a lovely lady in her eighties, who's been buying and selling collectibles since she was a young girl. 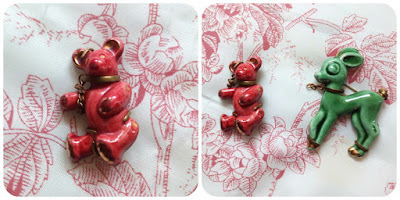 Her stall has all manner of lovely things, but my eyes immediately zoomed in to the red bear brooch, recognizing it as being from the same range as my beloved 1950s Bambi brooch. 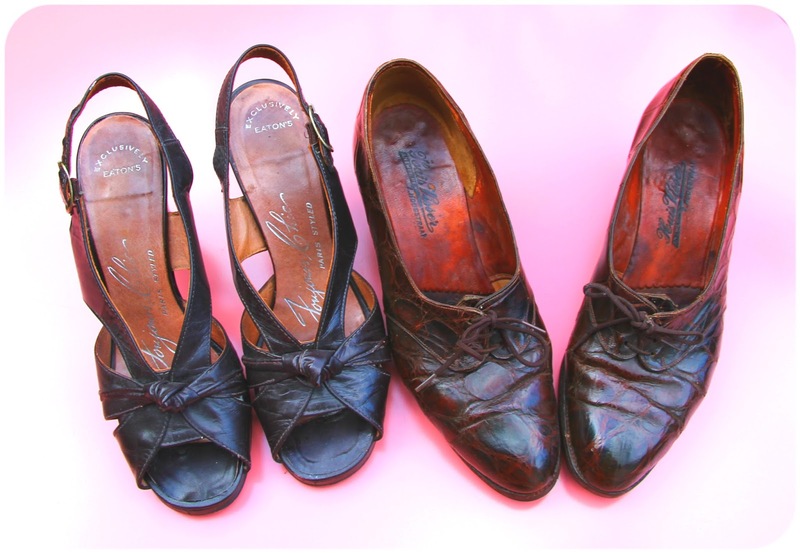 I also bought two pairs of vintage shoes from the same stall. The pair on the right bears the name of a long gone Antwerp shop. There were still quite a few aisles to trawl after lunch, but nothing really appealed to us, until we stumbled upon this boxed vintage Tala icing set. 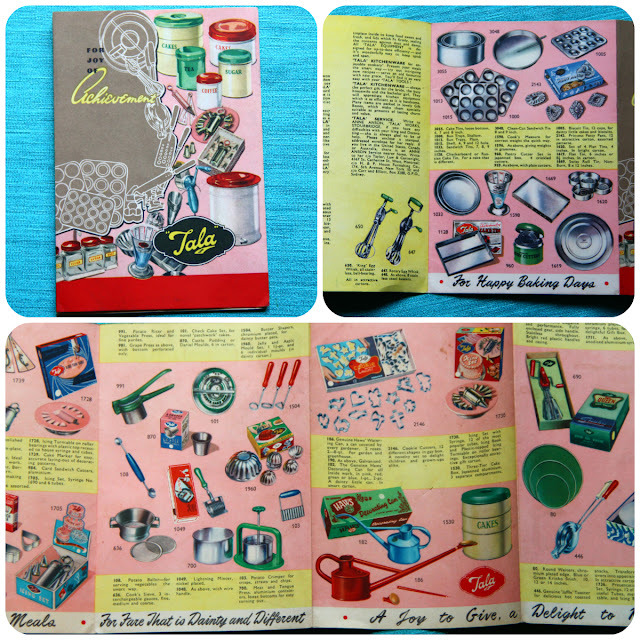 We have collected a bit of kitchenalia over the years - most of which we actually use - and even though there one or two Tala items among them, this is the first time we happen upon vintage Tala in Belgium. 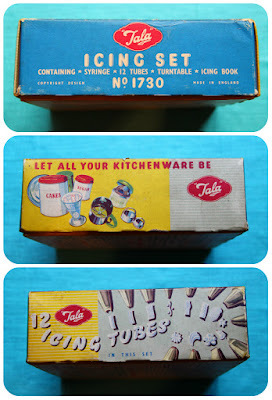 Tala is one of Britain's oldest baking and kitchenware brands. They were founded in 1899 in Stourbridge, which is in England's Black Country and not in Birmingham, as rightly pointed out by Vix, who's a Black Country girl herself! This set, which used to belong the seller's Mum, dates from around 1950. Not only does it contain a syringe and all of the twelve different icing tubes, there is a turntable as well, which admittedly is a bit wobbly. But there's more! 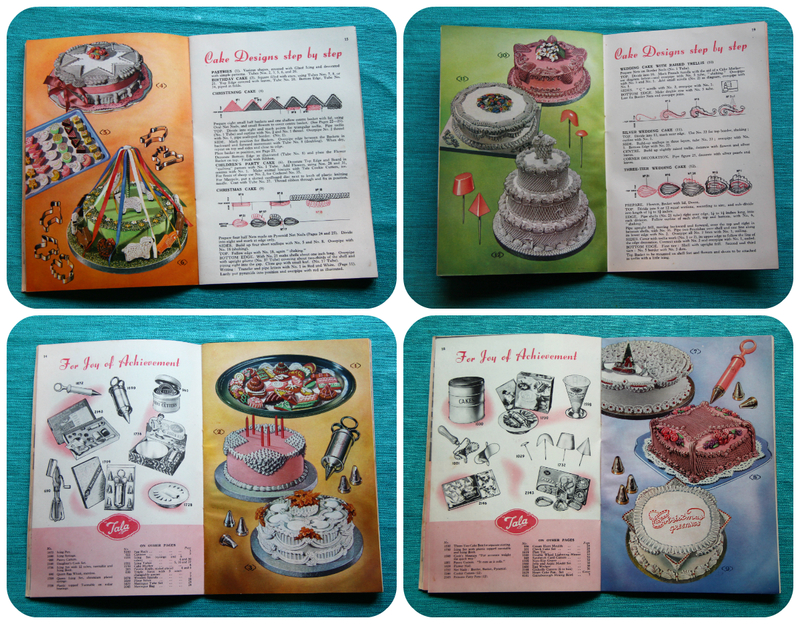 The set also contains a booklet, called "How to Decorate a Cake", for which Tala collaborated with baking and icing expert, Anne Anson. The booklet is a feast for the eyes, full of brightly coloured, mouth-watering illustrations of spectacularly decorated cakes and biscuits, with detailed instructions on things like flower making and designing icing patterns. But the box had yet another surprise in store! Look at this wonderful Tala catalogue listing all the available items in their bright and colourful range of kitchenware at that time. Most of which I wouldn't mind having in Dove Cottage's kitchen, I must add. 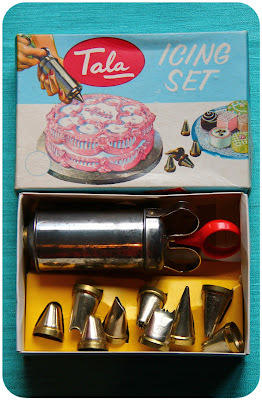 In spite of never having iced a cake, this isn't even our first icing set. 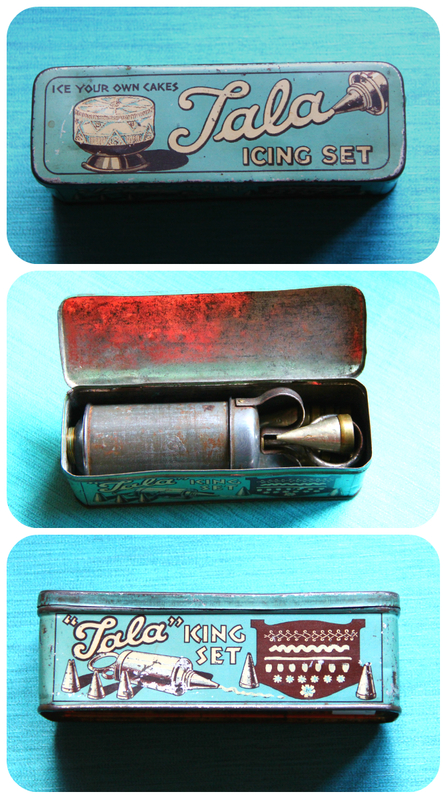 Slightly younger than our recent find, but still dating from the 1950, is this set, containing just the syringe and six icing tubes. At least that's what it said on the box. But look, we've got an extra three! We found it while on holiday in Wales, in an Aladdin's cave of an antique shop in Newcastle Emlyn. This cute little tin contains our oldest set, bought from a delightful shop selling kitchenalia in Rye, when we were holidaying in the area in 2005. This is Tala's "King Set" No. 1871 and apparently it was listed in their 1937 catalogue! As for the flea market, will we be going again? Never say never, I'd say! Don't worry! In spite of the title, this post is not going to be in German. But do read on, all will soon be clear! 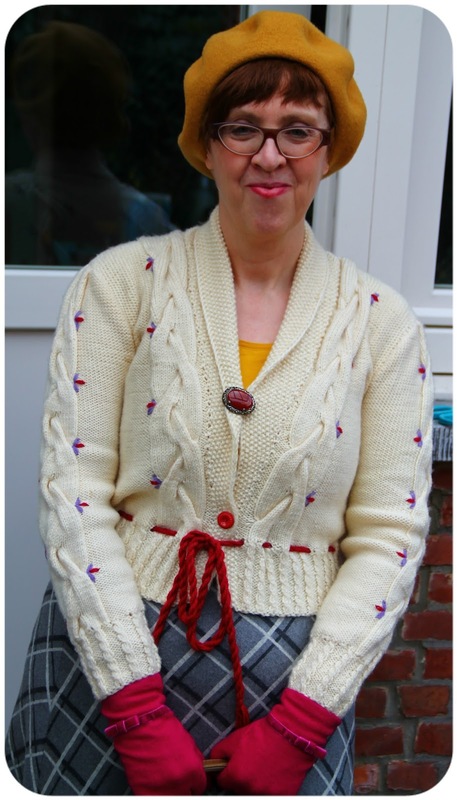 It was in Beate's Modish Matrons contribution back in January that my eye was caught by a gorgeous traditional cream cardigan she was wearing. I noticed its similarity with one of mine, and when I pointed this out to her, she hit upon the idea of doing twin posts! Das Doppelte Lottchen (freely translated as Double Lottie) is the title of a book by German author Erich Kästner published in 1949, about twin girls separated at birth who meet at summer camp. The phrase has since then become a common idiom in Germany, meaning a pair of girls with similar character and looks. For a couple of weeks, we emailed back and forth, exchanging ideas on what to wear, and a posting date was set for early February. Then, as a bolt out of the blue, Hurricane Friederike and two unprofessional tree fellers put Beate's life upside down, and plans were temporarily shelved. But life goes on, and so do bloggers, no matter what, and as we both had our outfits picked out and hanging ready, we decided the time had come to show them to the world! You can read fabulous Beate's post here. Having both our own distinctive styles, living in different countries, and never having even met in real life, isn't it uncanny how much like twins we look here? This is my version of the famous cardigan around which our outfits were built. I had to dig mine out of the depths of my wardrobe, as in the reasonably mild temperatures we had been graced with until then, warm jumpers and heavy cardigans were a definite no-no for poor menopausal me. Comparing notes on skirts, we opted for grey, even though mine has a black and white plaid pattern. 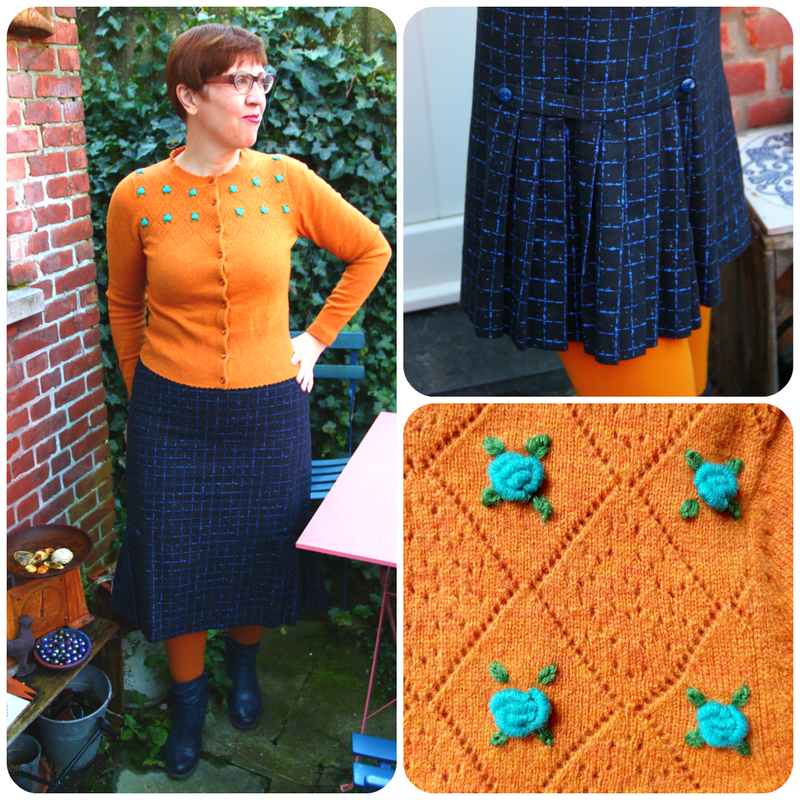 Being 100% virgin wool and made in Germany, it could only meet Beate's full approval. 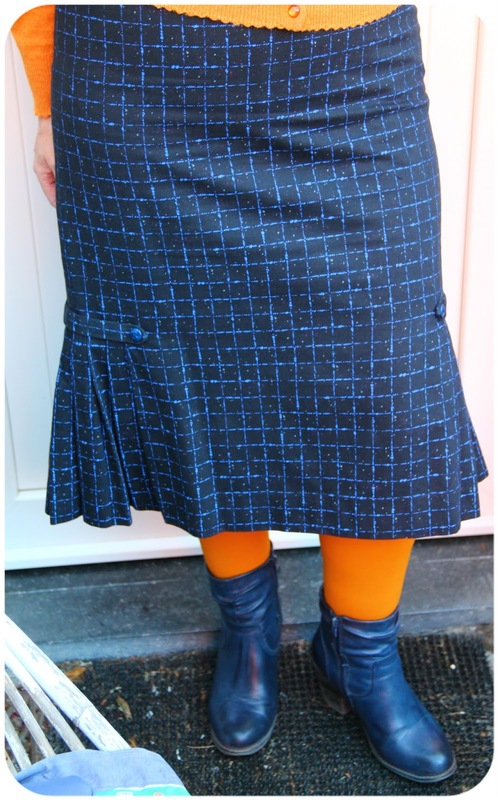 The skirt is very heavy and clearly made for colder climes and for girls not suffering from hot flushes! Upon closer inspection, there are quite a few differences between the two cardigans. While Beate's gorgeous blue trimmed one has a round neckline and buttons all the way through, mine has a deep shawl neck and closes with only one button just above the red drawstring. Buttonless when I rescued it from a rail at Think Twice, I gave it a new lease of life by adding a red vintage button. 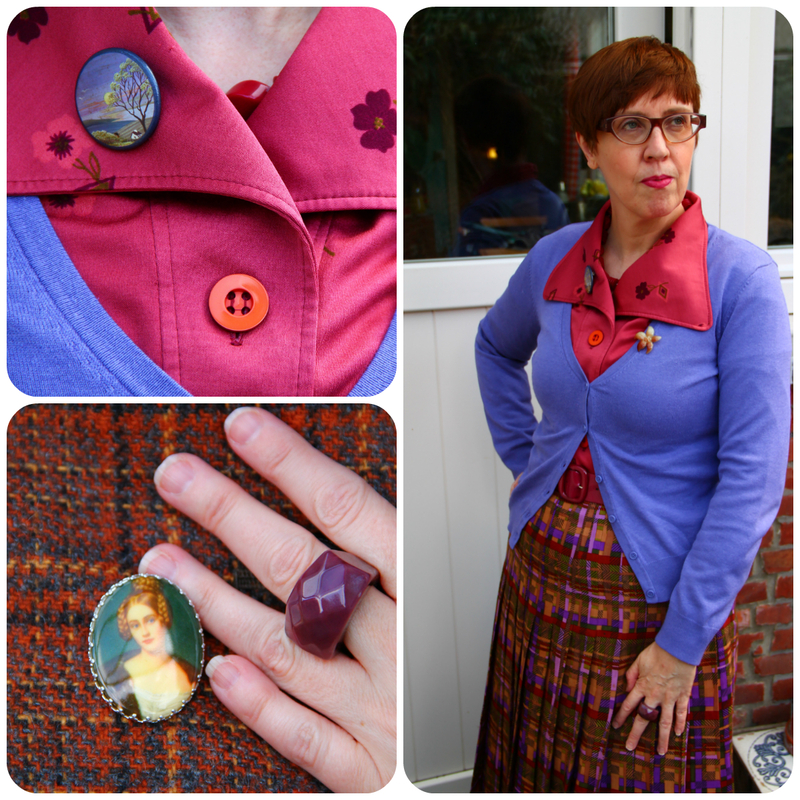 I'm wearing a mustard long-sleeved tee-shirt underneath and added a brooch with a red stone for modesty. Yes, I can hear you chuckling! 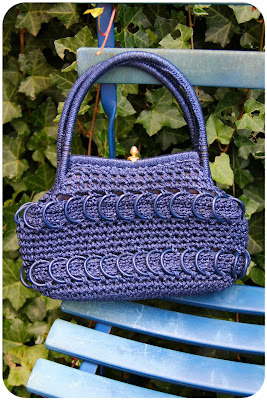 A suitable handbag was the next hurdle. I emailed a few examples and Beate's eye was caught by this faux croco bag, which incidentally is my current workday bag. Beate has the real thing, and as it was in need of an outing, the deal was soon struck. 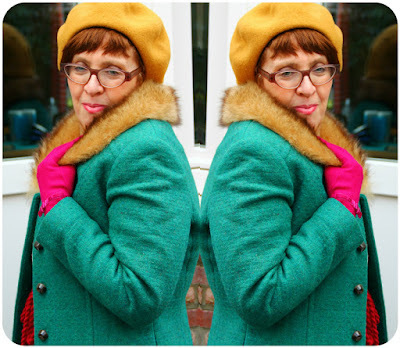 Outerwear was easy, as we both own green fur-collared jackets and mustard berets. 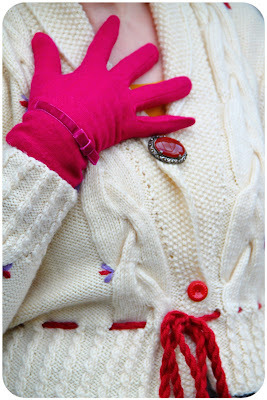 To add even more punch, Beate chose a fabulous pair of hot pink leather gloves. I initially compromised with red leather gloves but substituted these with hot pink boiled wool ones after finding them in the January sales. 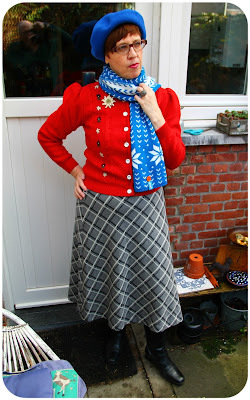 While I was digging out the cardigan, I happened upon another German-made wool cardigan, in red, with slightly puffed sleeves. This one is round-necked like Beate's. I remember it had metal buttons when I bought it - yet again at Think Twice - but as one was missing and most of others weren't in the best condition, I replaced them with white vintage buttons from my stash, which I think are a definite improvement. 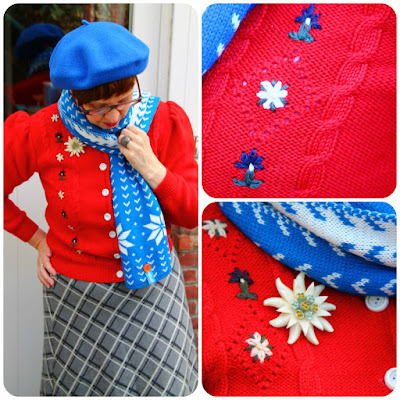 Look at that lovely cable knit and diamond pattern and those gorgeous embroidered flowers. To my eye, they look like Gentian and Edelweiss, so I added my largest celluloid Edelweiss brooch to keep them company. 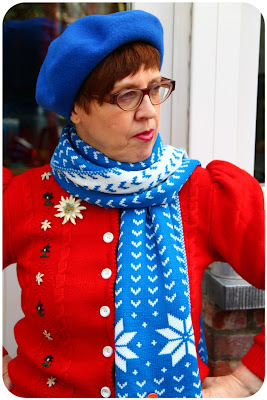 A bright blue beret and blue and white scarf, both charity shopped, were added for contrast. 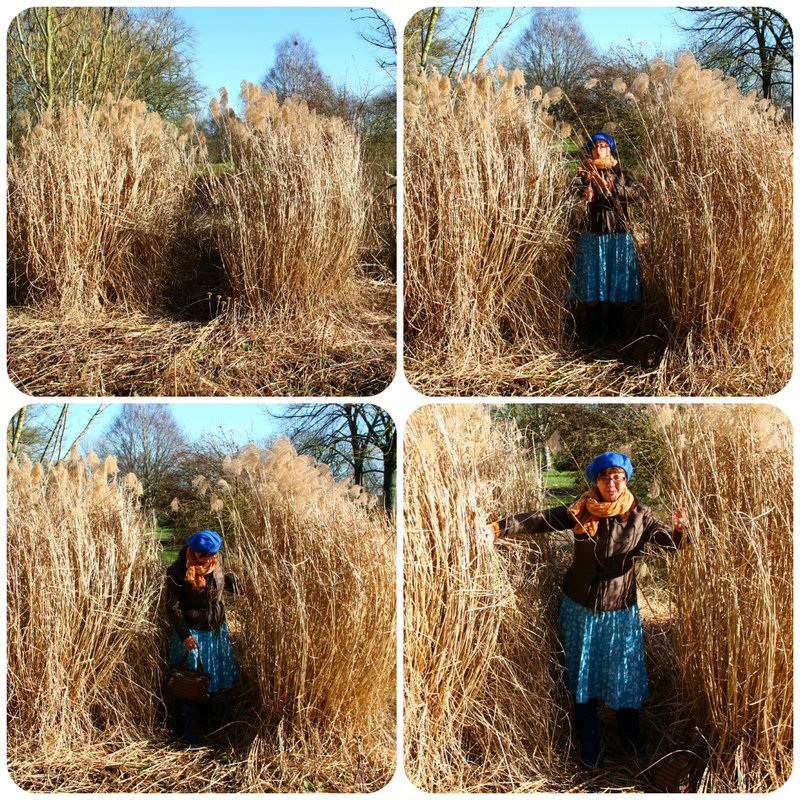 Now, I'm itching to pop over to Beate and read my twin's post, so off I go! Perhaps you would care to join me?